The Environment Secretary and the Chief Executive of the Environment Agency were part of a delegation which yesterday (8 Dec) visited the The Shoreham Adur Tidal Walls scheme which, when complete, will protect almost 2,500 homes and businesses in the area. 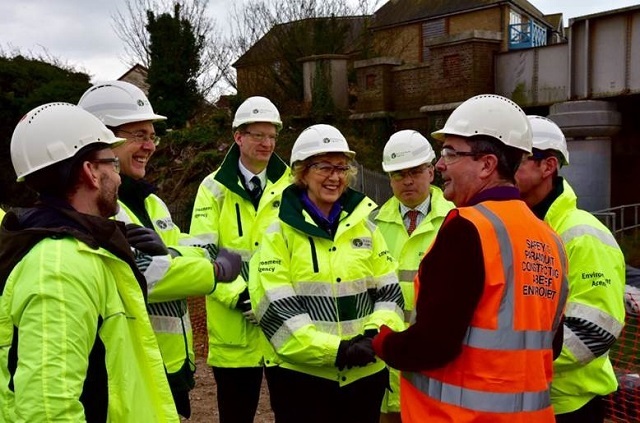 Andrea Leadsom, Sir James Bevan and the local MP Tim Loughton were shown round the site, which is being delivered by Team Van Oord (TVO). Ms Leadsom was ‘impressed’ by the project, which is due to be complete in 2018, describing it as ‘a great example of local businesses working with government to help boost local development’. Tim Loughton, MP for East Worthing and Shoreham, was also very complimentary about the progress on the project to date. The Shoreham Adur Tidal Walls Scheme is being delivered by TVO on behalf of the Environment Agency, Coast to Capital Local Enterprise Partnership, Adur District Council and West Sussex County Council. The scheme has a high profile within the local community as areas of Shoreham were flooded in 2013. The design addresses the current flood risk, and future risk as sea levels rise. Under the scheme improvements will be carried out along 7.2km of defences along the River Adur between Shoreham Old Fort and the A27, to significantly improve protection from tidal flooding to properties and businesses on both banks of the river. The scheme will also improve defences for Brighton City Airport, which was extensively flooded when the previous embankment failed during high tides in December 2013. Andrea Leadsom told the Shoreham Herald: “Shoreham-by-Sea’s new tidal walls, stretching for four and a half miles, will help shield the community from flooding, better protecting 2,500 homes and businesses as well as the airport.